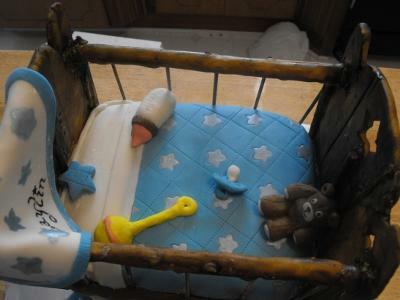 This is a crib baby shower cake I made for a friend of mine. She has an older son, and has been trying to become pregnant again for several years and has lost several children during pregnancy. I wanted this cake to be very special for her. I first contemplated making a bassinet, but in the long run a crib seemed less trying. I made the headboard and baseboard from fondant, gave it several days to dry, and then painted it with Wilton icing colors mixed with lemon extract and let to rest for a couple of days longer to harden. The cake was a blue velvet cake because she was having a boy and I also did blues on the outside. Everything was made from fondant and edible, except for the side rails which were painted skewers because I ran short on time. The top rails are Twizzlers wrapped in fondant and painted. She absolutely loved it, and kept the top decorations for his first birthday cake. It was so much fun doing the details! It's truly amazing what you do with cakes! Only an artist can do the things you do. I can't wait to see more! Fantastic detail, and edible!! Wonderful imagination! I've seen some of Ruth's work before but this cake took my breath away. She is not a "baker" but an ARTIST! Wow! When I saw this cake I couldn't believe how great it looked! Very detailed! It looks almost like my own son's crib! I'd love to have a cake like this for his 1st Birthday! Great Job Ruth!! This cake is too beautiful to eat, but too enticing not to!! This is pure talent right here! This cake is so super cute and the details are amazing! Great job!! I cannot believe the detail you put into your cakes, I don't know how you do it with little ones around all the time and school. I LOVE all of your cakes, they are truly remarkable. You get all my votes! It takes Pure talent to make something so detailed!!! It looks yummy but on the other hand looks too awesome to eat!!! This cake gets all my votes!!! Bravo!!! I always love seeing your cakes, they are always unique and impeccable! Amazing would be an understatement!!! I've been in awe of Ruth's cake creations for a while now, and this is her best one so far! Every detail is so intricate, and though I know it had to be a sometimes painstaking process, the results seem like the process comes so easily. I love this creation, and I look forward to many, many more to come!!! 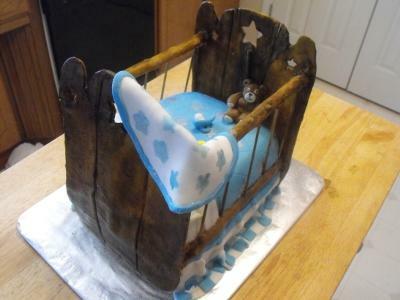 This looks like a very worn, family crib! I can't believe it's edible! What a great idea- I wouldn't want to cut it!